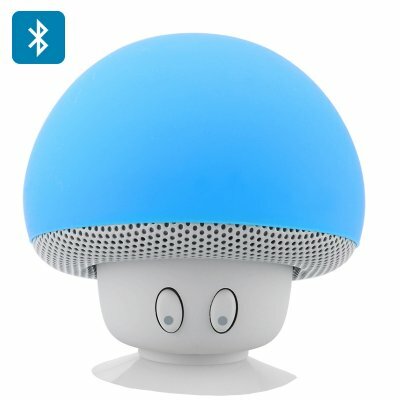 Successfully Added Mushroom Bluetooth Speaker - Splash Proof, Suction Cup, 280mAh Rechargable Battery, 3W Output, 10 Meter Range (Blue) to your Shopping Cart. A Mini Mushroom Bluetooth Speaker with a Built-in Microphone for hands free use it has a Splash-Proof Design and a Suction Cup so you can take the music with you even to the shower. Looking remarkable like the mushrooms of Nintendo’s Mario brother fame is this cute compact and portable mini Bluetooth speaker. With Bluetooth V3.0 connectivity you can easily sync this mini speaker to your phone or tablet and use it for playing music or to provide a quality sound when enjoying films or games. With a splash proof covering and strong suction cup that lets you stick it to most flat surfaces it can even be used in the bathroom, so now you can sing along to your favorite tracks in the shower while keeping your mobile safe as it has a 10 meter connectivity range. Alternately why not stick it to the rear of your phone or tablet so it can support it at a comfortable viewing angle? With call answering abilities you can use this as a hands-free way to communicate whether at your desk or in the car and at just under 70 grams this magical little mushroom is a perfect travel companion. The 280mAh built in battery gives you around 2.5 hours of play time from a full charge and with the supplied USB lead it’s easy to recharge from a computer’s USB port or power pack.